The lovely folks at Paramountzone sent me a couple of shiny new toys to review. 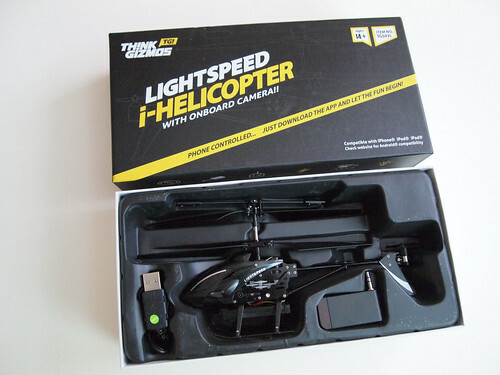 First, the Lightspeed i-Helicopter with on-board camera. 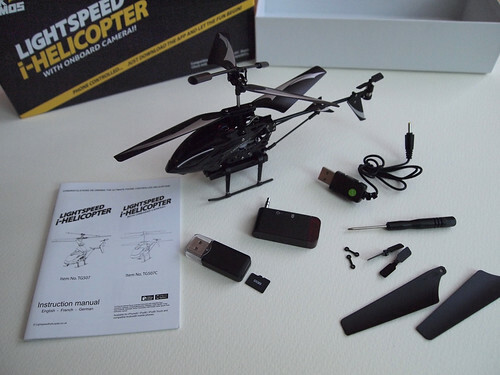 As always with these Lightspeed choppers, you get a good selection of extra bits in the box, including two rotor blades and two tail rotors. With this one, you also get an 2 GB micro SD card which needs to be slotted into the camera so it can store the photos and videos, and a USB micro SD card reader for transferring the files to a computer. 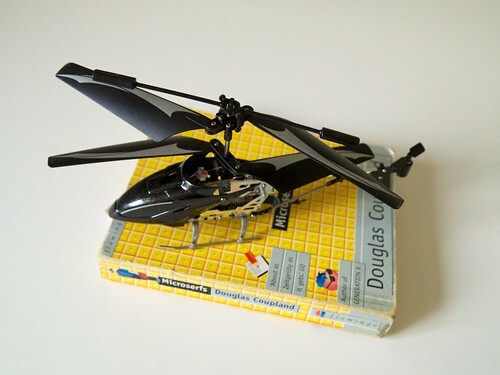 This is a slightly larger version of the original Lightspeed i-Helicopter. Making room for the underslung camera by raising the height of the skids. Obviously, the eye catching new feature here is the camera. The picture quality, at 680×480 (with 25 frames per second for video) is far from HD, but it’s not terrible either. How does it fly? It’s what you’d expect from a 3 channel coaxial helicopter. Up, down, forward, back, turn left, turn right. 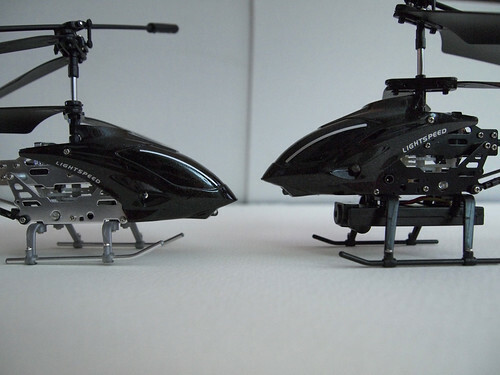 Lots of fun as a first helicopter, though frustrating if you’ve used 4 channel RC choppers (which add the freedom to also strafe or ‘crab’ left + right). 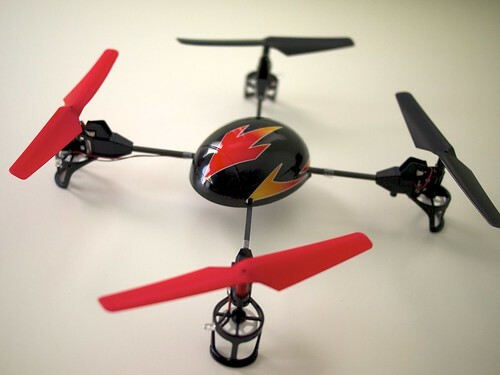 It’s definitely sturdy enough, and by dropping the power before a crash landing (to protect the blades) it’ll take a lot of punishment indoors. I’ve crashed it, a lot, with no ill effects. 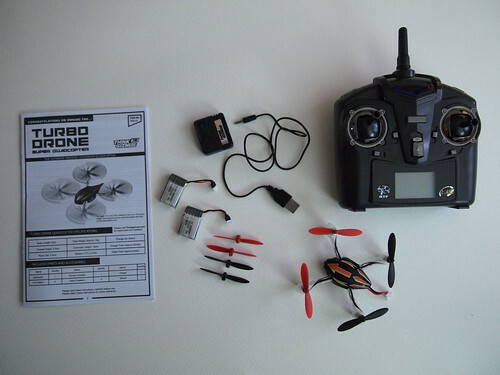 It’s not really designed for outdoor flight, thought I’m very tempted to try it (on a very still day) if only to get some impressive footage of flying outside. 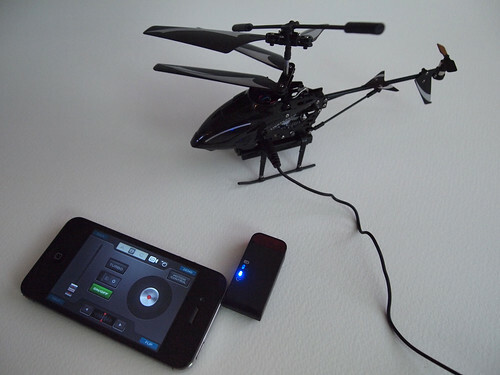 The box boasts that the Copter Controller app is “compatible with iPhone iPod iPad” but warns you to “check website for Android compatibility”. 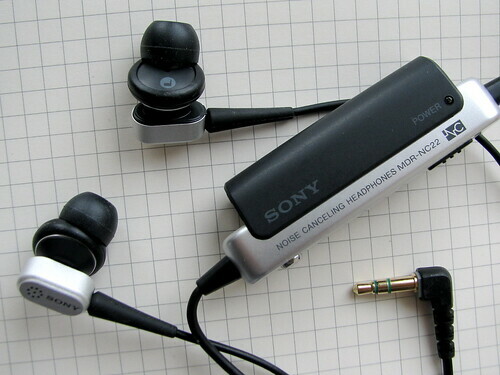 Pleasingly, when you do, it works on a wide range of devices. 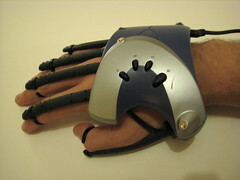 lack of tactile feedback on the remote (i.e. your phone/tablet) means you’re looking down at the app a lot, especially to control the throttle. The controls for taking photos and video is a bit small and fiddly on small screen too. 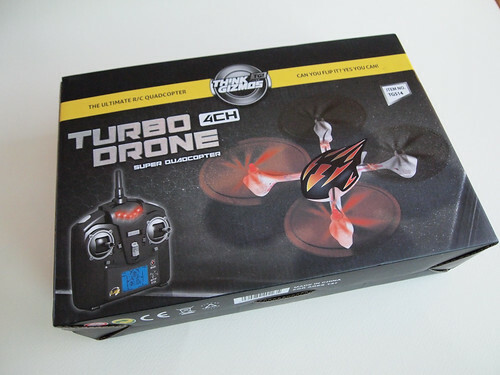 Second, I also got a chance to play with the new Turbo Drone super quadrocopter. 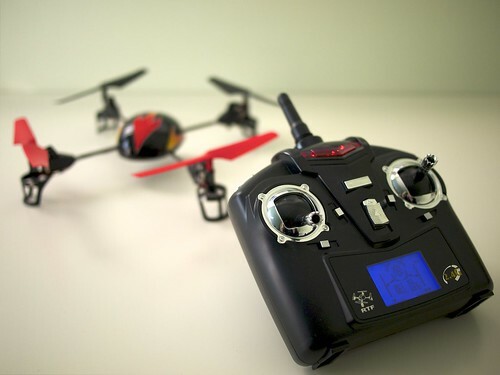 Have I ever mentioned that I love quadrocopters? Opening this box was super exciting. It comes preassembled, obviously. Small and light but sturdy. It fits neatly in the palm of my hand. 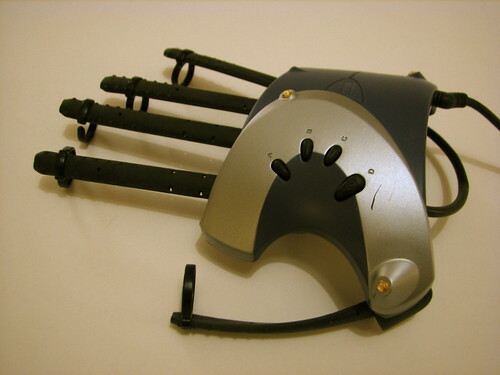 It comes with spares for all four blades, not one but two batteries, and a USB charger which can charge either one battery at a time or both batteries at once. 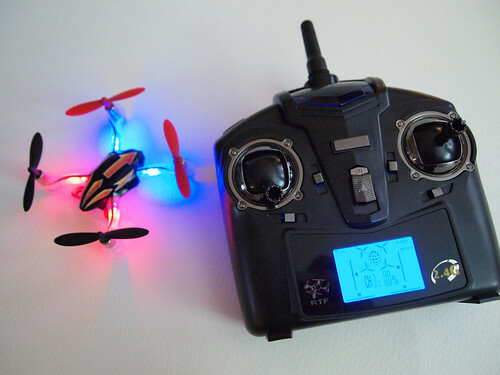 Compared to the older, bigger Turbo Drone I reviewed last year, this one is a lot smaller. 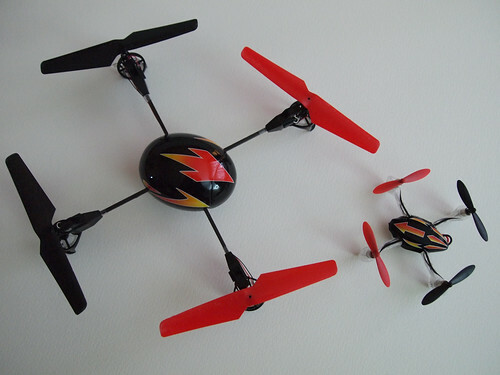 Having flown both, I think that for this sort of toy, bigger isn’t always better. 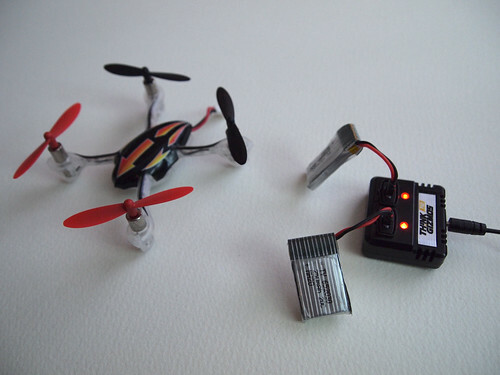 This new smaller model is a lot more fun to fly indoors. It needs less room to manoeuvre, it feels less scary to crash it into furniture and it feels really nimble and powerful. The large arrow on the case, the colour of the blades (red = front, black = read) and the colour of the LEDs (blue = front, red = rear for some reason) all help know which way it’s facing. 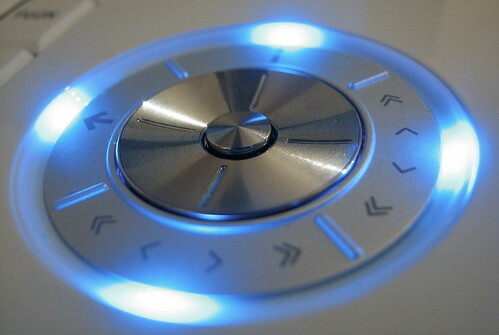 The remote has an adjustable sensitivity setting. 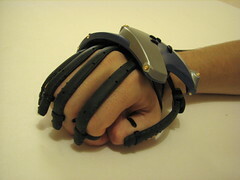 20%, 40%, 60%, 80%, useful when gaining confidence and moving and turning more and more quickly. The 100% setting (which makes the remote controller screen change colour from blue to orange so you see it at a glance) is not really a further 20% of sensitivity, but rather moves the device into full on insanity mode and unlocks the ability to flip the drone. Both are good, but of the two, this is definitely the one I’d recommend. Easily the most fun remote controlled toy I’ve tried (and my collation is getting pretty good) and the one I’ll be most excited to master. 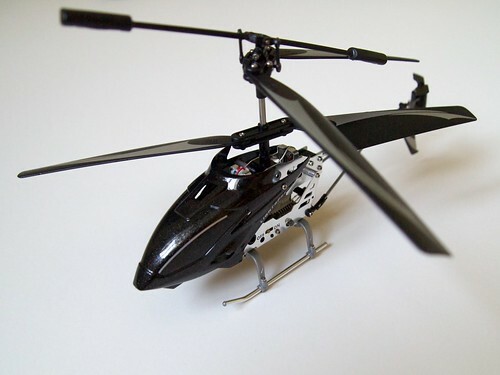 Of all the RC helicopters Paramountzone are selling at the moment, this and the 4 channel V911 helicopter are probably the best value and most exciting. 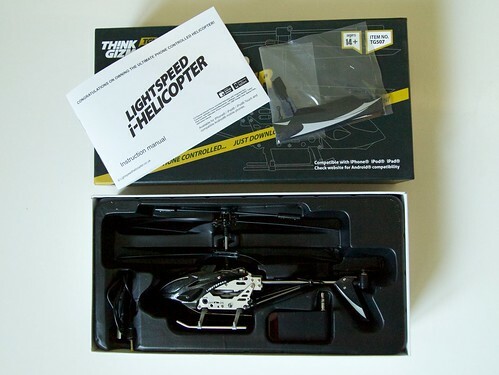 The nice people at Paramountzone were kind enough to send me a Lightspeed i-Helicoter to review. 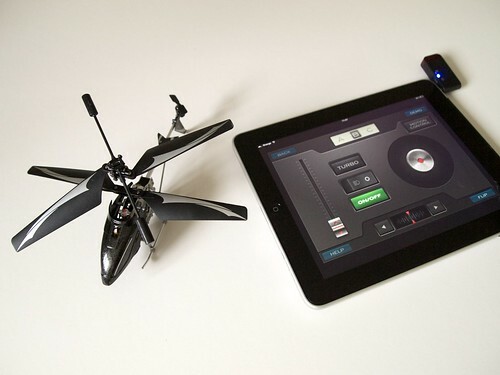 It’s an iPhone / iPad / iPod / Android controlled helicopter, and (having played with a few micro-copters in the past) I can honestly say this is the best I’ve seen. Rather than a separate remote control, the controller is your phone/tablet in conjunction with a free app and a rechargable infrared transmitter, which plugs in to your headphone socket. Assuming you’ve got one of the supported devices, this is a great setup (Currently supported: iPhone, iPod, iPad, HTC Desire S, HTC Desire HD, HTC Incredible S, HTC Wild Fire, HTC Wild Fire S, HTC Hero, HTC Sensation, Samsung 9100, Samsung i9000, Moto MB525, LG P350. With more to come, apparently). No on-board video streaming to the phone though. Not that you’d really expect it for £30. To fly it, after an initial charge, I simply installed the free iOS app on the iPad, plugged the IR dongle into the audio jack, and I was off. There’s also an ‘motion control’ option; a mode which lets you control forward/back/left/right by simply tilting your device. I found this mode a tiny bit easier, though the altitude control still needs a careful thumb to control it. 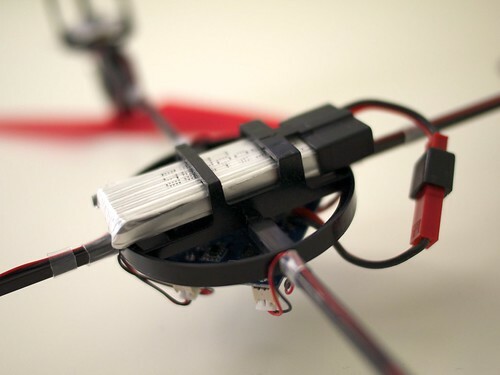 20 minutes of charging (via USB) gets you about 10 minutes of flying time. It’s bigger than I was expecting, and the metal frame means it feels satisfyingly sturdy. At first I was a bit nervous about damaging it, but I’ve since crashed it into pretty much every surface in my house with no damage to show for it. I’ve not even had to open up the included bag of spare parts. I’m impressed at how sturdy and durable this thing is. By killing the power whenever I get in trouble, and just letting it fall out of the air, I’m now very confident about flying it around indoors. The app includes a ‘Turbo’ button (“for when extra speed is required”) which I expect will be useful when flying in an open plan office. So far I’ve not needed it much in my house. Cons: Unlike a regular remote control, using a glass screen means no feedback from the altitude control, which takes some time to get used to. Pros: Fun, fast and easy to control. 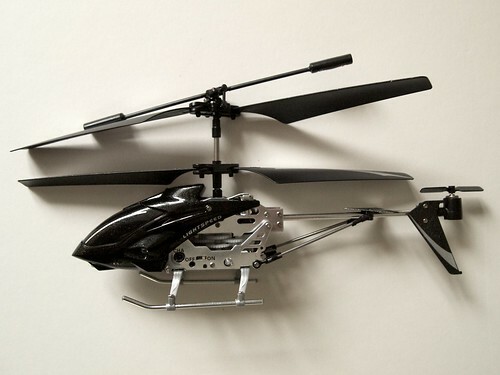 Gyroscopic helicopters are really good these days, but this one is remarkably strong and durable. This is a really great toy. Highly recommended. If you’re interested in ordering one, here’s the UK/Europe (currently £29.99 with free delivery) or the USA (currently $59.99 with free worldwide shipping). The Tomy GX Buggy is a micro remote controlled car from Tomy, the people who bought you the Q-steer and, before that, the Char-G. I reckon they’ve managed to come up with something even more fun here, and was very pleased when I was offered a sample to review. To get the obvious stuff out the way, the car is tiny and it’s fast. 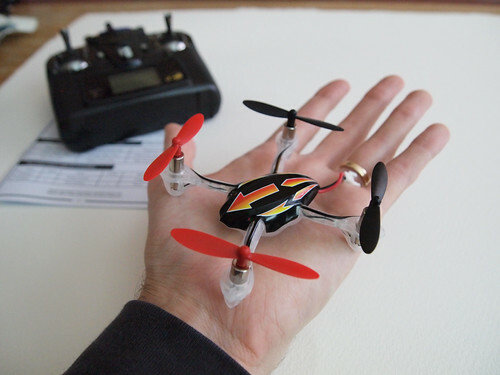 At 10 cm long, it easily sits in the palm of your hand and at a mere 42g weighs next to nothing. Tomy claims it will do up to 22km/h. I was sceptical at first, but having seen it in action I can believe it. It’s certainly more than fast enough for bombing around indoors. 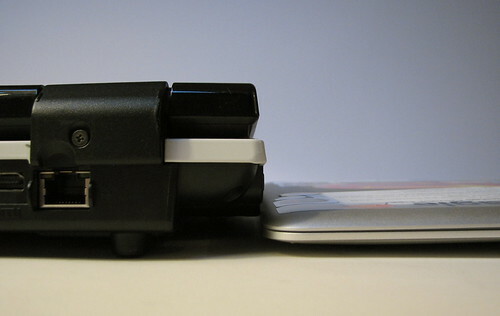 It takes about 20 minutes to charge using the portably charging unit (which takes 4 x AA batteries, not included). From that, you get about 10 minutes driving time. For comparison, it’s about half the price of the Losi Micro T (though of course you lose a few features including proportional steering, full suspension and rubber tyres). The GX Buggy remote control (which takes 2 x AAA batteries, not included) offers proportional acceleration, plus braking and reverse as well as (non-proportional, i.e. just left/straight/right) steering. I’d quite like proportional steering, obviously, but even without it the car is an awful lot of fun to drive. The foam rubber tyres are perfect for indoor use, with good grip on both lino and carpet. Since it’s so small and light, you’d expect it to flip over when it hits things and spend a lot of time upside down. It cleverly self-rights though thanks to a plastic ring, the ‘roll wing’, which (usually) puts it back on its tyres very pleasingly. And, being so small and light, and with such good acceleration, it can jump really high even with quite a short run up. I have not tried it outside yet, but while I think it’ll run ok on tarmac I would be a little nervous about how long the foam tyres would last. I would love to take it to a concrete skate park and see how it performs there though. Should be lot of fun in a half pipe. I recently received an interesting offer from TalkToshiba; they offered to lend me a laptop on the condition that I write an honest review of it. I get to play with a nice toy for a few weeks, you (and they) get to hear how I got on with it. Sounds fair to me. Let me make that perfectly clear: if the offer had been on the condition that I write a positive review, I’d have said no. The fact that they asked me to “post up your thoughts about the laptop on your blog … whether they be good or bad” and being able to tell the truth about the machine is the only reason I even considered it. Unpacking it (from a big, heavy box that I’d assumed would be mostly packing material. 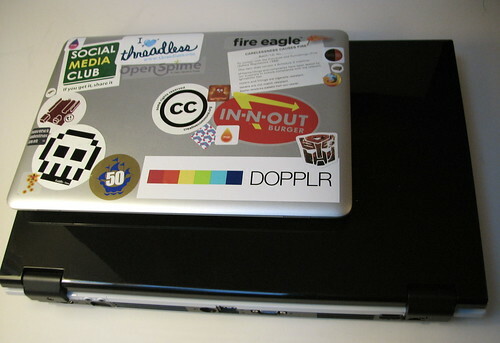 Oh no, it really is that size) my first reaction was that I had never seen a bigger, heavier laptop. Opening it, I was struck by the distinctive design. Shiny, intricate and odd. Over time, that wore off and I now think of it as odd, and more than a tiny bit irritating. That’s partly because this isn’t the right laptop for me. Commuting every day means I value portability. Don’t expect this to be portable. It truly is a desktop replacement. In fact, you’ll want to plug in a mouse and keyboard too, because the layout is pretty dreadful. 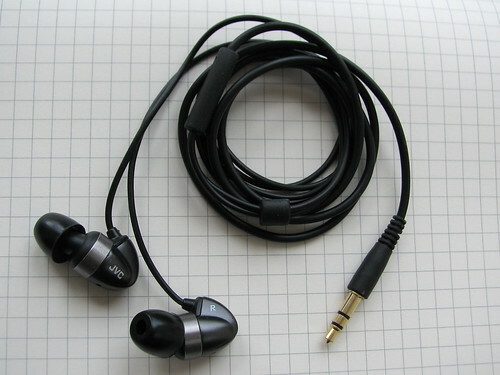 On the plus side, it is quite powerful, has every connection you’d ever need, and the sound quality is amazingly good. 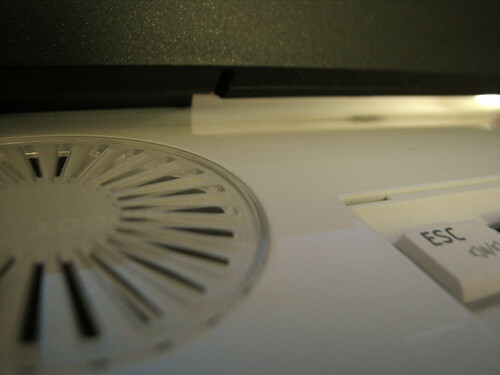 When it did sometimes feel sluggish, I blamed the fact it was running Windows Vista. Oh, how I hate Vista. That’s not Toshiba’s fault though, and I should have installed Linux really. Here’s what it looks like. The speakers vents are huge, and the visual aesthetic here seems to be ‘turbine’. It’s big. 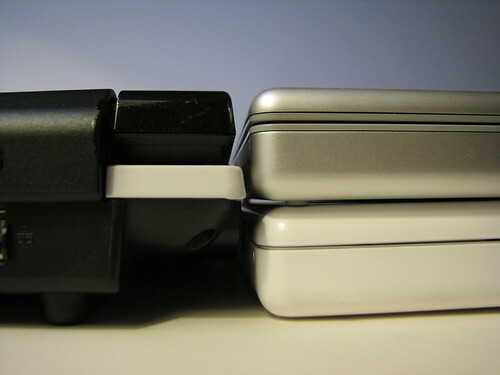 Here it is stacked up against my wife’s MacBook and my MacBook Pro. The two put together are almost exactly the same height as the G40. And here it is up against my MacBook Air. Perhaps not a fair comparison, but look at it. Insanity. It’s covered in unnecessarily bright and numerous blinkenlighten. Not very soothing on the eyes. The biggest problem, especially given the machine’s generous proportions, is having a teensy-tiny trackpad with two teensy tiny buttons, with a fingerprint device right in the middle, just in the way. The design is, frankly, dreadful. 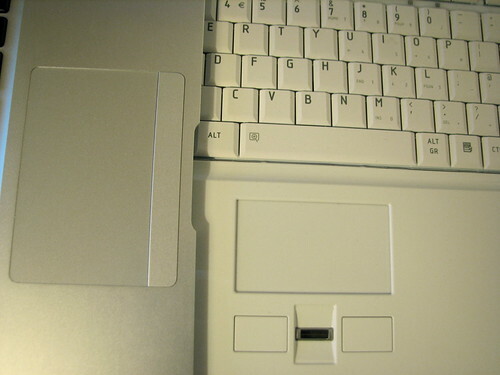 The MacBook Air, despite being a much smaller laptop, makes room for a good-sized trackpad. There’s no excuse for a monster like the Qosmio G40 to have me scratching around on a surface half the size. HD-DVD. Seriously. I think the battle between BluRay and HD-DVD has been decided, hasn’t it? It’s doesn’t really matter though because, being over a year old now, Toshiba no longer sells this laptop. The G50 has an even bigger (and I hope brighter) screen, but I don’t think I’ll be buying on. I like my laptops to be something I can put on my lap without fear of injury, and I returned the G40 without being terribly sad to see the back of it. Thanks to TalkToshiba for the loan though. In case you missed it, the super secret new side-project has finally gone live. My wife’s gone to the Caribbean. There are as many of these jokes as there are place names and the imagination to create (sometimes quite convoluted) puns with them. The 1st line is a setup, 2nd line is a place-pun, 3rd line is a retort. It’s all about respecting the constraints of the form, in the same way that Haiku are more beautiful because of the constraints, not despite them. 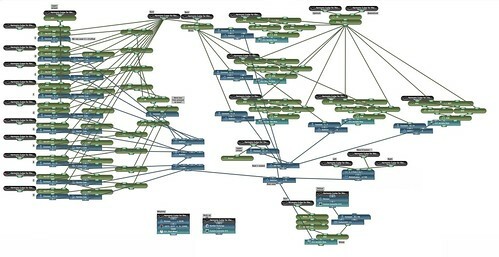 My favourite feature – and I can say this with full modesty because, as with most of the interesting features, Nick added it – is the master map. In the four days since we quietly launched the site it has already grown from 24 to 62 jokes meaning that we’ve already reached a stage where user contributions outnumber our own. Some of them are really funny too (someone calling himself Gruff has been responsible for some of my favourites so far). There’s lots of work still to do but if you’re inspired to add your own or want to find out more then come join us. It’s already a lot of fun.